HOW ABOUT THAT FRONT DOOR!!! Spring is right around the corner and with that will come all of the various home improvement projects you have thought about all winter long. Maybe painting the front door should be one of them. 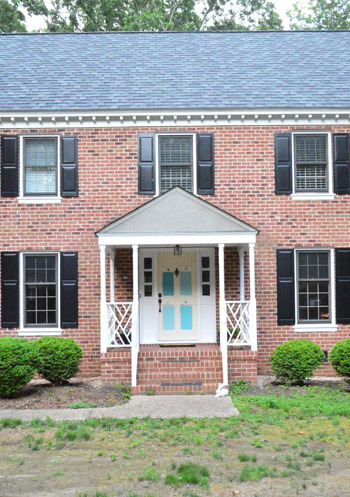 It used to be that your front door was painted to “blend in” with the rest of the house. No real thought was even put in to the front door color. If you wanted color – add some flowers. The good news is those days are long gone as nowadays anything goes. 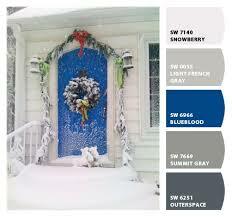 You can literally paint your front door any color that suits your mood and you can make it work. If you don’t know how to start maybe we can give you a little direction. This is a project that is easy to do yourself too if you have a little bit of time and painting skills. There are endless options for the new color of your front door but whether you choose a neutral color or decide to step up and choose a high contrast hue do a little extra homework to make the door your very own. The first thing you want to do is NOT limit yourself to any specific color. Open your imagination to anything and everything and consider the other colors in your home and its surroundings. Get input from everybody in the house and who knows what color you might end up with or where you will find your inspiration. Sit at your kitchen table and try to narrow it down to a few different colors and then take and tape those swatches to your front door because there is no question those colors will look very differently once on the front door versus what they look like while sitting at your kitchen table. 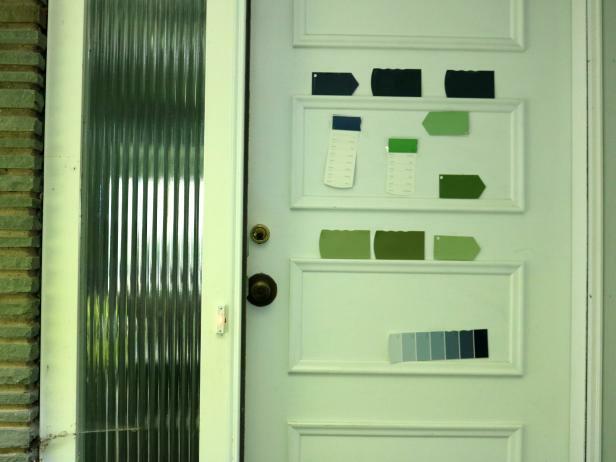 You can then narrow it down to a few colors and apply all of them to the door so that you can get a better idea of what those colors will look like at different times of the day. This way you won’t have to paint the entire door a number of times until you get the right color. Once you have chosen a color the rest is easy. Start by picking a fair day that will allow you to keep the door open all day long. This will give the door ample time to dry throughout the process. First you want to sand down any imperfections in the door, apply a coat of primer and then apply 2 coats of the final color and ala, you have the final product! Now, if you are having trouble picking a color it might help to know what some door colors say about these that select them. In many cultures they associate rather complex meanings to the colors we choose for our home, especially the color we choose to paint our front door. The front door is thought to be the “mouth” of the home, the entry point where energy, abundance and opportunities may find us. Wow…that’s a pretty big responsibility to hang on a front door! Blue is a favorite of those who are looking to add Feng Shui to their home. It suggests a feeling of abundance and prosperity. 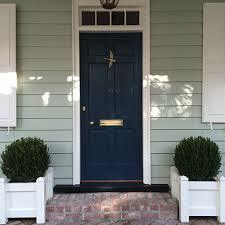 Dark blue doors are believed to bring positive energy to your home while creating a calm and peaceful environment. Yellow evokes confidence, humor and merriment and shows that you are willing to take chances. 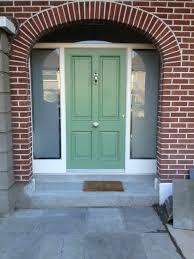 How about a green door? Green represents peace, compassion, growth and harmony. A great color almost any time. 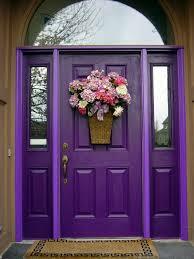 Purple is becoming a more popular color for your front door. It is a bold choice that some say tends to invite opportunity! Who knows, but if it looks good for you then give it a try. The classic white front door. It has the old world charm that will always be a good choice, and sometimes depending upon the color of your house, the absolutely perfect choice. White represents purity and serenity and gives a clean and inviting look. 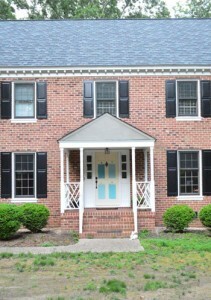 And last but not least there is also the red front door. 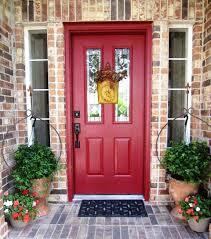 In Feng Shui a red front door means “welcome”. It also meant the same thing in early American tradition. In fact, tired travelers who might be traveling by horse and buggy would know the home was a place where they would be welcomed to stop and spend the night. In Scotland, homeowners paint their front door red to signify they have paid off their mortgage. As you can see, the options are endless and there really is no wrong choices so don’t be afraid to step out and show everybody who you are. Let your personality show and be proud of the color you choose, whatever that color may be. 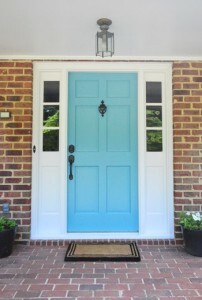 And if you need help with the color choice, or want somebody to paint the door for you, don’t be afraid to give us a call. We would be glad to give you a hand.